Fast Company is redesigning its print magazine to convey a friendlier and more gender-neutral appearance, starting with the November issue. The changes were led by Fast Company creative director Mike Schnaidt, who joined the team earlier this year from Men's Health. Schnaidt does not want the business magazine's issues to look the same, but allows flexibility to change and evolve the new look. “This is the first step of an even bigger visual change,” Schnaidt told Publishers Daily. There are more infographics in the front-of-book section and an expanded use of illustrations throughout the magazine. Schnaidt believes the magazine should employ a friendlier aesthetic, over a futuristic one. Fast Company’s last redesign was in 2013, when “companies like Uber, Google and Facebook were really exploding and fetishizing over the future and technology,” Schnaidt said. Schnaidt wanted the same for the new Fast Company design: “to feel more accessible, more friendly. The state of business in 2018 is less techy,” he added. Fast Company’s readership has a nearly even gender split (about 52% male and 48% female), an uncommon audience mix for a business magazine. A 10-page photo essay in the November issue focuses on the inclusion of the first male cheerleaders in NFL history for the LA Rams football team. The story focuses on the themes of “workplace diversity and inclusion,” Schnaidt said. Fast Company is introducing an updated logo, too. Designed by Rui Abreu, the logo keeps the playful small-cap "A" and "O" letters in the name, which date back to 1995, but the contrast between heavy and thin lines is more pronounced. “We wanted to keep the playfulness, but make [the logo] feel more sophisticated and elegant,” he said. A section called "The Recommender" in the Fast Company magazine is expanding from two to six pages in each issue. It will have more space to highlight places, objects, travel tips and work hacks. "Magazines have to offer a reader a good chunk of information to encourage them to buy at a newsstand or subscribe,” Schnaidt said. As a result, the magazine is “chock full of good, smart information." 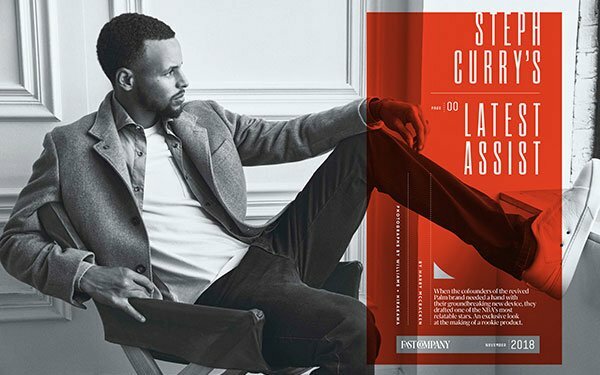 The issue drops today, October 15, with a cover story on Steph Curry as the face of Palm, a new, pocket-sized gadget with many smartphone features.